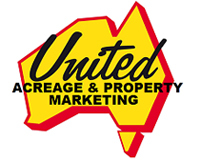 Click here for the complete Night 2 results. Click here for 65 Pit / Presentation photos from Night 2. 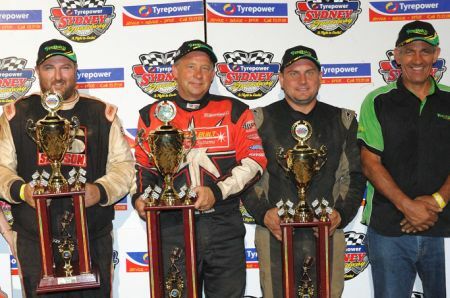 ABOVE : Happy Australian Late Model Championship podium as (left to right) 3rd placed Michael Holmes, winner Steve Francis, and runner-up Jamie Oldfield, celebrate with race sponsor Ross Nicastri (Frank's Auto Parts). Photo by Gary Reid. 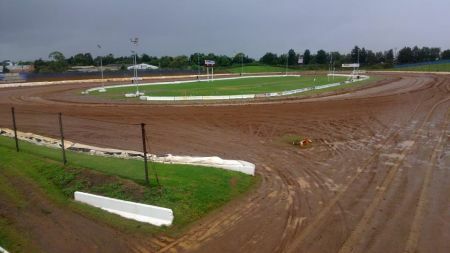 Australian Late Model Championship. 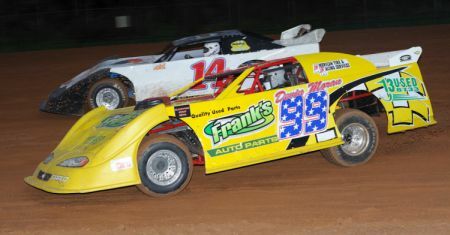 Devin Moran runs up top in the USA#99. 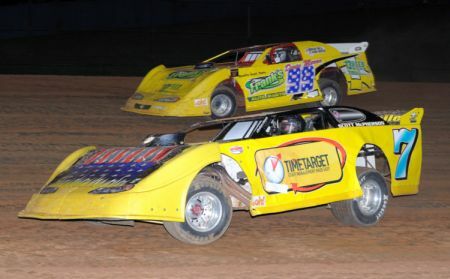 ABOVE : Jason Oldfield wins Heat 12. 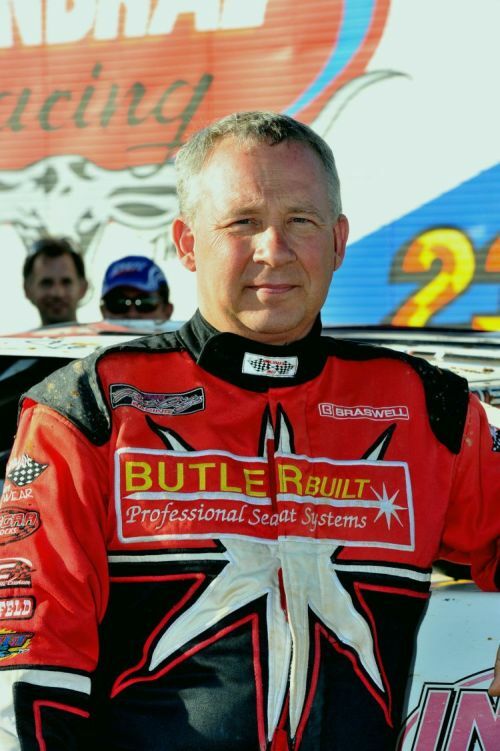 ABOVE : Kev Stow gets tipped over on Night 1.
in his first ever Late Model race meeting! 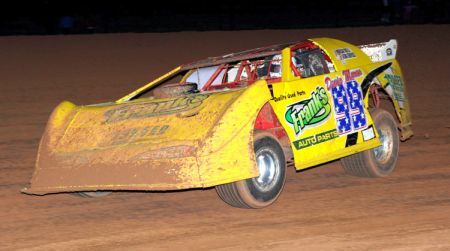 ABOVE : Steve Francis in action on Night 1. Photo by Gary Reid. ABOVE : Devin Moran dives under Victorian racer David Mentiplay. 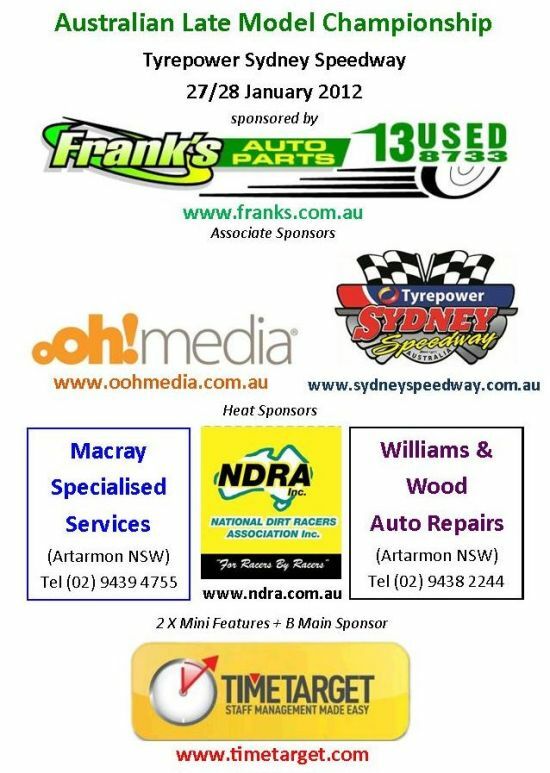 Click here for complete results from Night 1 of the Frank's Auto Parts Australian Late Model Championship held at Tyrepower Sydney Speedway Friday 27th January 2012. 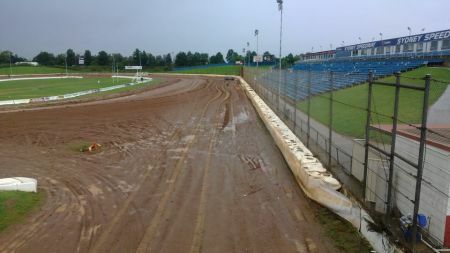 After night 1 Francis leads on points from Moran and Jamie Oldfield. 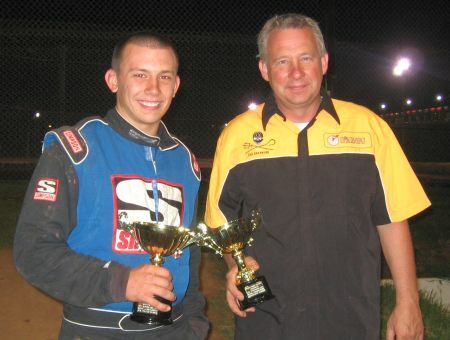 ABOVE : Steve Francis (right) and Devin Moran picked up the hardware in the Time Target Mini Features on night 1. Photo by Rod Thurgood. Check the Photo Gallery page for 50 photos from Night 1. ABOVE : Steve Francis. Photo by Peter Roebuck. 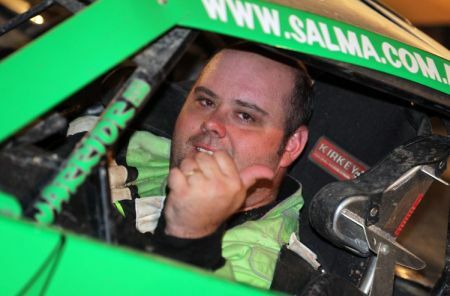 ABOVE : Devin Moran wants victory in the Aussie title. Photo by Gary Reid. ABOVE : Mat Crimmins will be hoping to improve on his 3rd place finish last year.